InterNations April Event At Della Nonna Trattoria In Poblado! 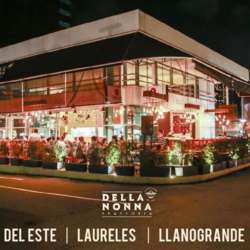 Come join us for a night out in Poblado at Della Nonna Trattoria! Enjoy this part of town, it's safe, friendly and beautiful! Our friends at Della Nonna Trattoria can't wait to serve you and treat you special!! The best Italian pizza and food service. We have the place to ourselves on a quiet street in Poblado, if you haven't come to Poblado now you can!!! InterNations will show you different parts of Medellin. Come enjoy excellent wines and conversation! The service at Della Nonna is excellent!! #3 Drinks are included with your entrance either sangria, domestic beer or soft drinks!!! The three drinks are from 19:30- 21:30 after which is open bar, come enjoy great Italian food and drinks!! Shots and liquor are not included in the 3 at the door! The idea is to patronize the local places in Medellin and show our love for Medellin! !